I made a decision at the beginning of my career as an independent lighting designer that I was NOT going to become a specialist in any one project sector. I believed that the experience gained on any one project would go on to inform my future design thinking – and that’s exactly what happened. And besides, in 1984 the lighting designer was still a rare sight to see around the project design table – so just being a lighting designer was specialist enough. And as I look through my project portfolio, I can see how that early decision stood me in good stead. After all, lighting is only about people and we’re not that different wherever we happen to be and whatever we happen to be doing. Its just that our focus shifts depending on what we’re about – and that’s really the secret of good lighting design; understanding the subtle ways that our attention shifts as we go about our lives . . . and how lighting serves us in so many of those ways. I’ve separated my portfolio into different sectors, to help you find your way around the work. Here are the main headings. Just click on the image to go to that section of the portfolio. All kinds of display is covered in this section; museum and gallery; private and public; intimate and grand. We really have to take our exterior lighting seriously. Too often, a single building is lit as if it stood alone in a field, and not a piece of a jigsaw that is our built environment. Its time to take a bit more care. This is not just about ‘historic buildings’; I’m taking this to include those buildings that play a part in the cultural/social/spiritual life of a society. So it’s not just ‘old stuff’ that reflects an earlier time; this is also about buildings which still play an active part in our lives. And when all the important stuff is done, its great to have places where we can go to relax and enjoy ourselves – just that. Although I rarely undertake commissions specifically to design a light fixture, I realise that I've actually been responsible for quite a few of them. Always associated with a project and with a specific space in mind, these have provided me with lots of interesting fun, sitting down with the people who actually make things. 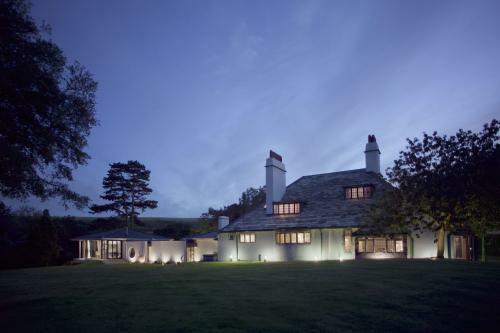 There is something very special about helping people to realise their dreams; knowing that, once the last light fitting has been fitted and the contractors have cleared away, all those meetings and all that design work is finally resolved into a place where families come together to enjoy their new homes. Can Smart Lighting Save The Planet? Can Lighting Save Us From Ourselves . . . NO!